About 4 years ago my wife and I bought a house - a house that architects would describe as "Second Empire Cottage." Our friends, however, are not architects. Actually that's not totally true as John "Johnny Solid" Dwyer of the critically acclaimed Shelter Architecture is an architect and a damn good one at that. 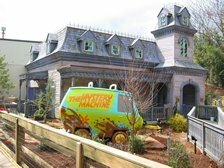 Anyhoo, our friends, 99% of whom are not architects, look one long look at our new place and unanimously declared "it's the Scooby Doo Mansion!" And the name stuck like crazy glue to construction worker's helmet. We've been hosting parties and our annual talent show as well as scaring the bejeebus out of trick-or-treaters ever since. And, yeah, it looks a little like the picture above. Except not in an amusement park. And there's no van parked in the front yard. It it wrong that I want personal credit for naming the mansion? Because I do believe it was me! Big Kiss! I just got your link from Lucas! That would be so cool to live in a house like that! I will stop back by!